"I got this recipe from one of my cooking classes in college. It's the "old fashioned" type of appetizer, but one that makes a beautiful display on the plate and I never take any home with me because they disappear quickly." Using the tines of a fork, score the unpeeled cucumber lengthwise on all sides. Slice the cucumber into 1/4-inch thick rounds. In a small bowl, combine the cream cheese and blue cheese dressing. Spread the cheese mixture on the rye bread slices. Top with a slice of cucumber and a slice of olive. I thought these were pretty tasty but many of my guests were afraid to try them. Super easy and really tasty. I alternated black and green sliced olives. This recipe was deliciously delicious! The olive gives a really nice taste to it, but I tried it with black olives instead of pimento, it tasted really good! 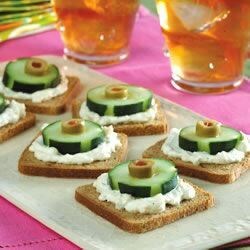 I served this to a group that meets monthly and people asked me at the NEXT meeting about those cucumber thingys. Especially nice for spring and summer.